The Indigenous People of Biafra (IPOB) will never resort to armed conflict or rebellion, notwithstanding the killings, arrest and arbitrary detention of its members, says its leader, Nnamdi Kanu. 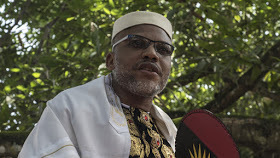 Kanu said this in an interview with newsmen at his Afara-Ukwu, Umuahia country home, on Wednesday, while reacting to President Muhammadu Buhari's national broadcast on Monday. He, however, said that the group had formed a security outfit, known as `Biafra Security Service' to checkmate the activities of suspected herdsmen in the South-East. "IPOB is a peaceful mass movement. "There is no record of where people fought or engaged in open altercation in any of IPOB gatherings. "We are the most disciplined, well-behaved mass movement anywhere on the face of the planet." He, therefore, implored Buhari to adopt a peaceful approach and dialogue rather than threat in dealing with separatist groups in the country. Kanu said it would be counter-productive for security agencies to apply the same measure used against Boko haram insurgents on IPOB. According to him, the plan to use brute force rather than dialogue to deal with Biafran agitators will not work. He expressed dissatisfaction with the comparison of IPOB to Boko haram, which he described as an "internationally recognized terrorist organisation". "It is well-known that IPOB has remained a peaceful, non-violent organisation since its formation,'' Kanu said.